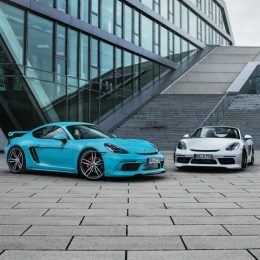 TECHART intensifies the sporty character of the Porsche 718 Cayman and 718 Boxster models. 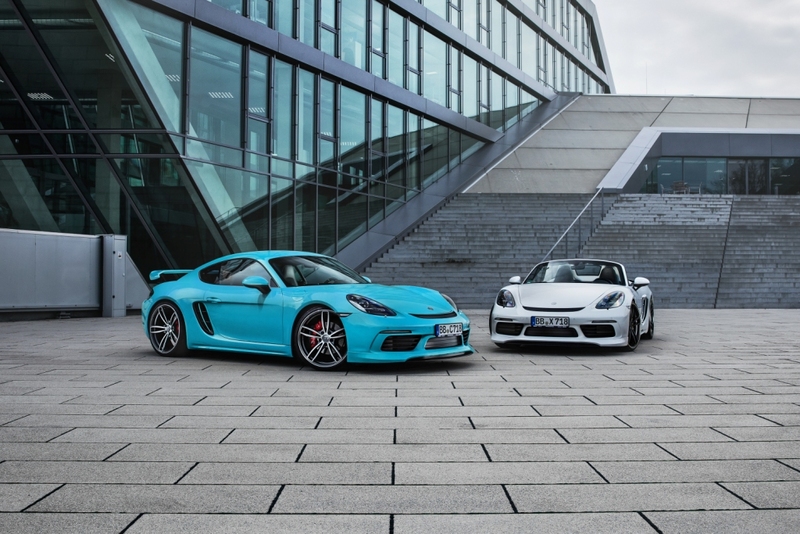 The TECHART aerokit for the new Porsche 718 Cayman and 718 Boxster models, boosts the dynamic appearance of these mid-engined sportscars. 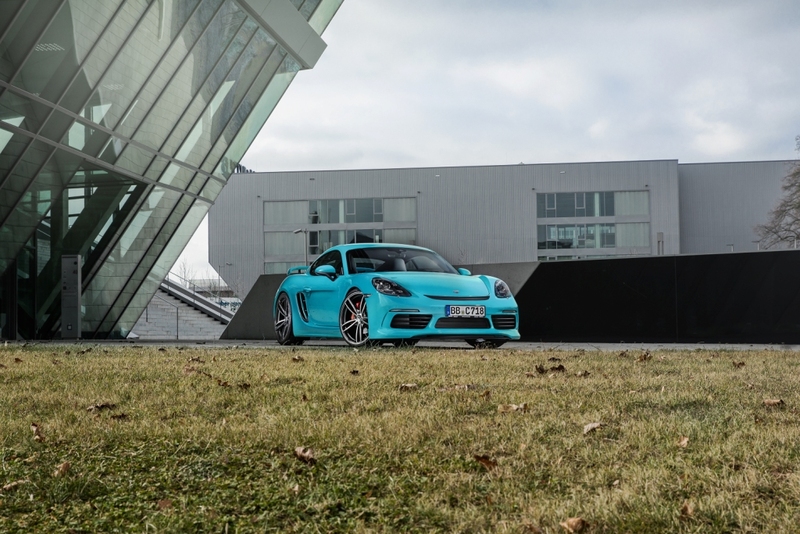 The front apron gets optically extended by the two-piece TECHART front spoiler with its integrated splitter. A central air outlet helps to reduce the aerodynamic lift. 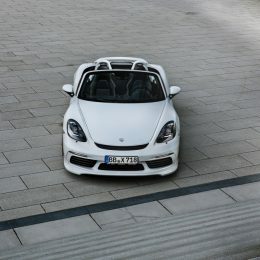 As well as the front splitter, the air outlet is available in black PU-RIM or carbon fiber. The lateral air intakes are enhanced by curved air intake fins. 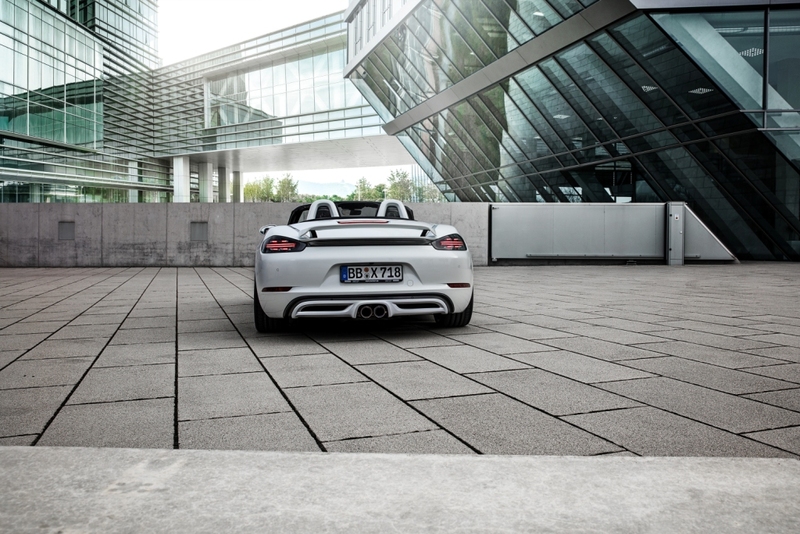 The TECHART rear diffusor smartly surrounds the two central tailpipes. A highlight of the TECHART exterior program: The fixed rear spoiler on the rear lid. 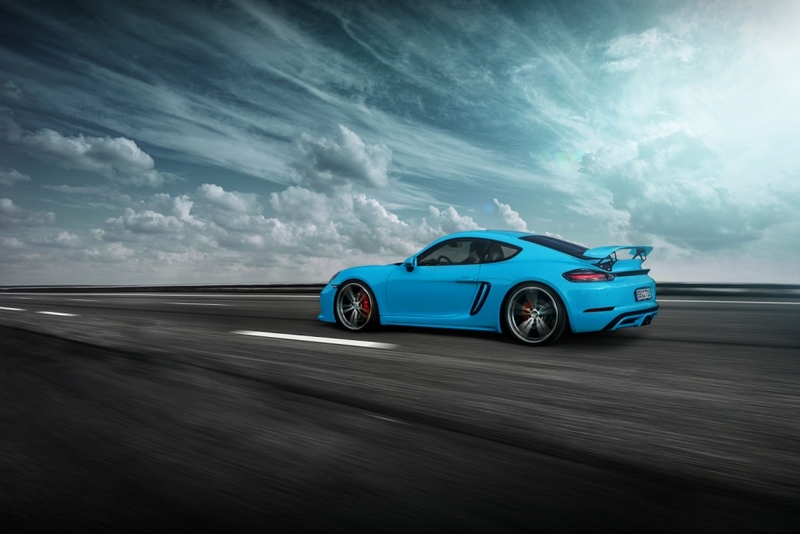 The wing profile of the TECHART rear spoiler I is available in body color or carbon fiber. 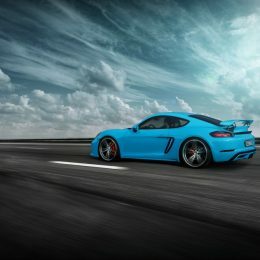 The Porsche 718 Cayman can be equipped with the prominent rear spoiler II. It is designed in a motorsport look with black anodized aluminium uprights. 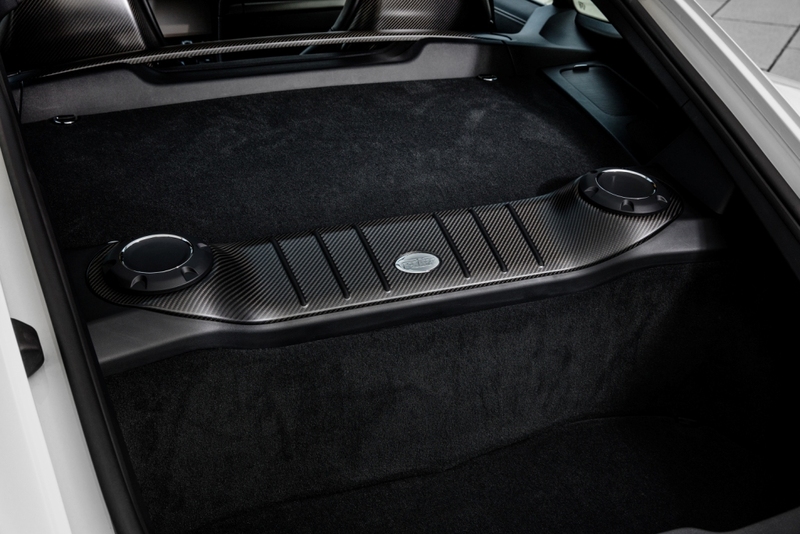 The TECHART carbon parts, manufactured at TECHART in Germany, are available in matt or glossy surface finish. The 30 mm lowering, combined with the weight-optimized 21-inch Formula IV alloy wheels, put the mid-engined 718 models in the spotlight. Progressive TECHART sports springs provide a direct and sporty road handling. 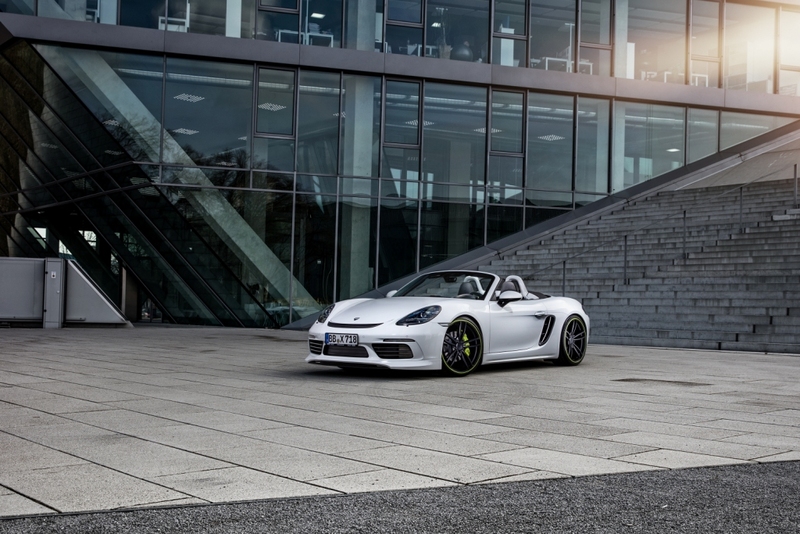 The TECHART Formula IV alloy wheel with its dynamic twin-spoke design is available in 9 x 21 and 9,5 x 21 inch for the Porsche 718 Cayman and 718 Boxster models. Besides the attractive standard color variants, all TECHART wheels are also available in individually matched custom colors. 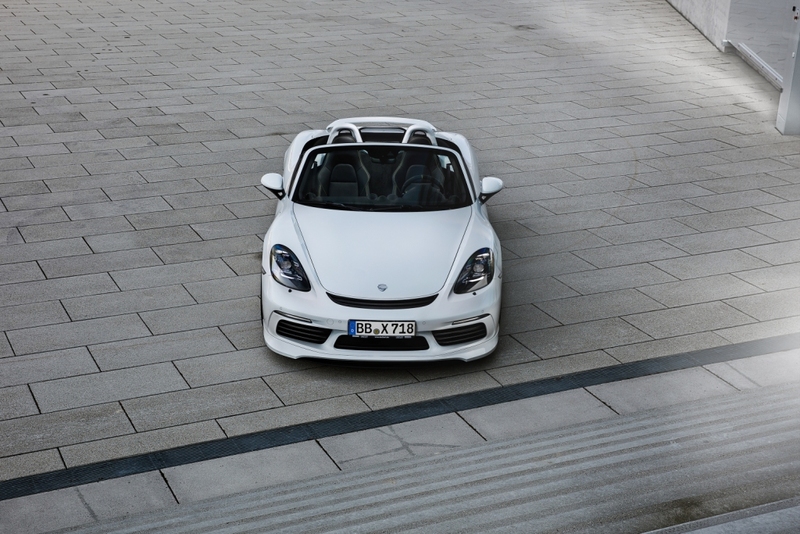 The enjoyable low-end-torque of the Porsche 718 models is increased by the new TECHART TA082/S1 powerkit. 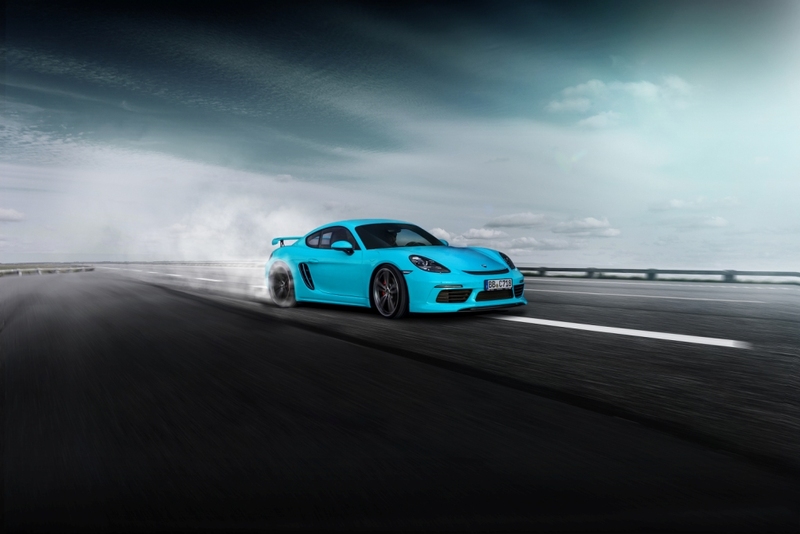 Even at 2.800 rpm, the 2.5 l flat-four engine with TECHART TECHTRONIC provides 480 Nm of torque to the rear wheels (series: 420 Nm). 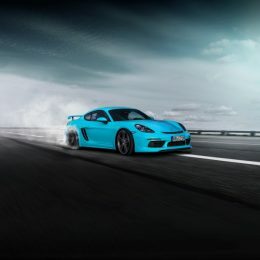 With active TECHART powerkit, the 2.5 l model accelerates from 0 to 100 km/h in 3.9 s – as fast as a Porsche 911 Carrera S. Fueled by a total power output of 400 hp, it provides a top track speed of 296 km/h. The operation of the TECHTRONIC powerkit is intuitive. 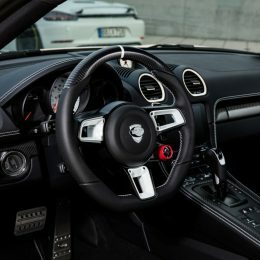 To activate the permanent power boost, the driver simply switches from NORMAL to SPORT or SPORT PLUS mode by using the standard Sport Button at the center console or the optional mode switch at the steering wheel. Coming with an EC type approval and backed by an extensive warranty, TECHART TECHTRONIC merges impressive power enhancements and peace of mind. The TECHART exhaust system »Racing« creates a deep, powerful boxersound with a clear difference between “Normal“ and “Sport“ setting. The valve control is invisibly integrated and easy to use due to its connection to the standard Sport Button or the optional mode switch. 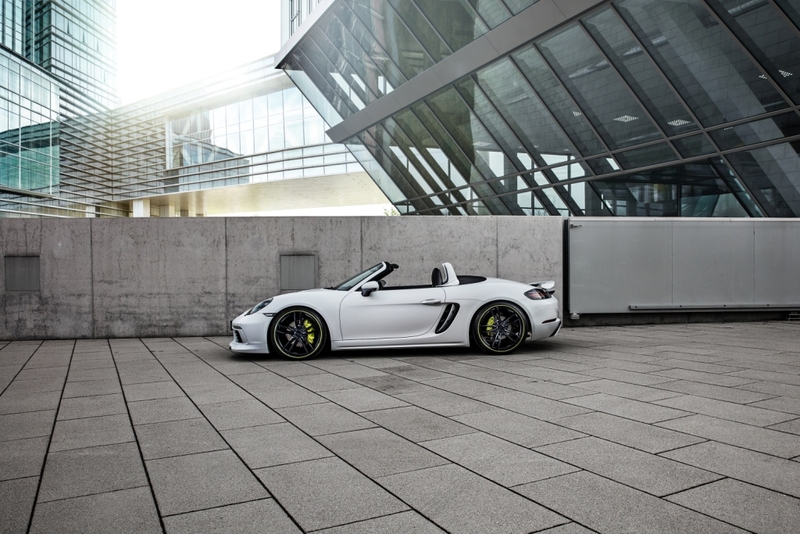 For the 718 models, the TECHART exhaust system »Racing« features two central titanium tailpipes with carbon fiber tips, that give an unmistakable statement. 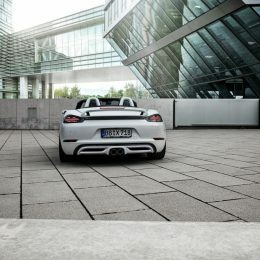 As an option, the TECHART exhaust system »Racing« can also be installed with the factory tailpipes. The TECHART Manufactory processes carbon fiber with accuracy and precision. The surface finish is available in matt, glossy or individual color. 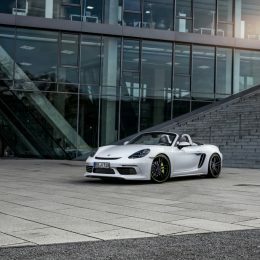 The exterior of the Porsche 718 models can be equipped with a carbon front splitter and a carbon wing profile. 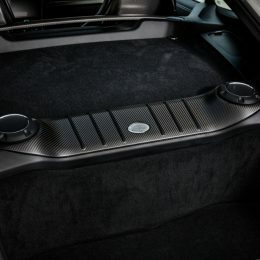 Carbon fiber interior refinement is available for the steering wheel, the dashboard, the center console, the door panel and the Sport Seats Plus. 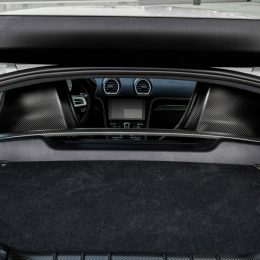 TECHART carbon panels for the luggage bar and for the trunk rear enhance the view through the rear window of the Porsche 718 Cayman. 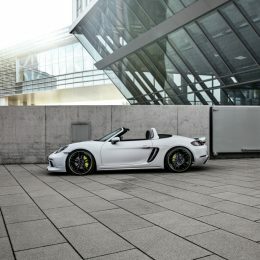 The in-house saddlery transfers the individual preferences of its owner to the interior design of the Porsche 718 Cayman and 718 Boxster models, manufactured by TECHART in unsurpassed craftsmanship. The illuminated TECHART aluminium door entry guards give an eye-catching welcome. 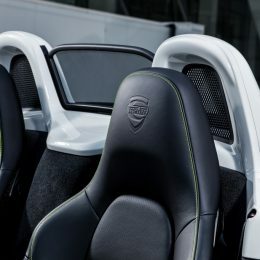 Besides full individual treatment of the interior, TECHART assists its customers in setting selective highlights such as any kind of leather refinement and upholstery, decorative stitchings, carbon made or lacquered seat backpanels, in-house produced carbon trims and lacquered surfaces or color-matched instrument dials. The TECHART »Type 7« sport steering wheel uses the 718’s optional Porsche GT Sport steering wheel as its basis. With its smaller diameter (360 mm) and the ergonomic shape, it fascinates the driver in many ways. From the raw steering wheel rim, TECHART’s master craftsmen then give it its typical ergonomic shape, padding and finishing with finest leather, lacquered trims, carbon fiber segments, Alcantara®, leather piping and any other TECHART options the customers may choose to individualize their steering wheel, before it is finally sewed by hand. Any functionality of the original steering wheel is maintained such as multifunction, paddle shifters as well as the optional mode switch. All TECHART steering wheels based on a heated series steering wheel are now available with an optional heating, so this comfort feature can be maintained even though the steering wheel is fully individualized. 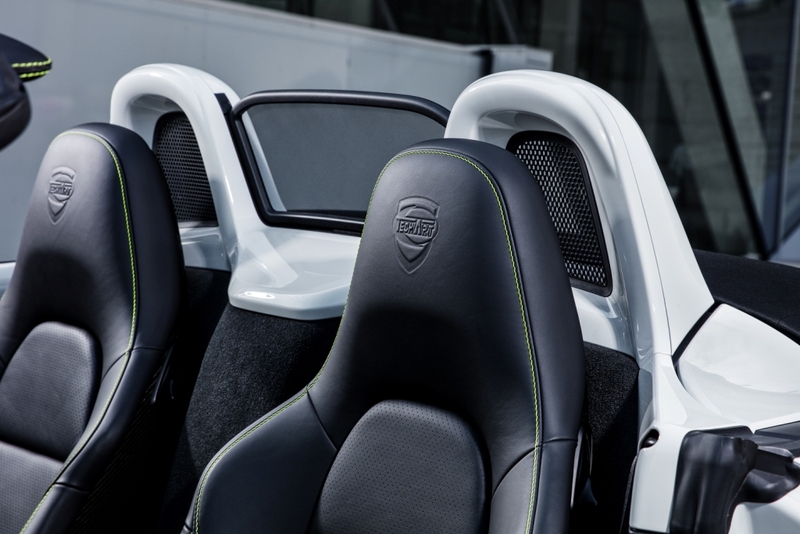 The paddle shifters integrate seamlessly with TECHART’s new paddle trims, made of fine leather or Alcantara®.